Our Commitment to Health and Safety. 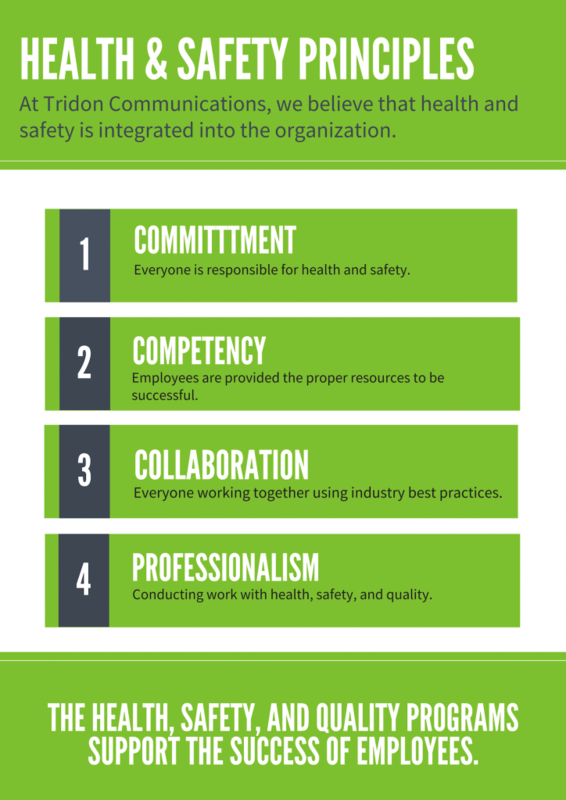 Safety practices do not stand apart from daily activities; they are integrated into all aspects of the organization, and everyone at Tridon Communications plays an important role in creating a healthy and safe workplace. That’s why we empower our employees with the proper training, equipment, and mentorship to do their job successfully. Tridon Communications is committed to helping employees understand their right to know how to do their job safely. This includes their right to fully understand the legislation and industry standards that apply to their work scope. Tridon Communications recognizes the importance of competency; all employees will be trained and competent in the work they conduct. Tridon Communications creates a proactive approach to the identification of workplace hazards. Work will not be conducted without a hazard assessment. 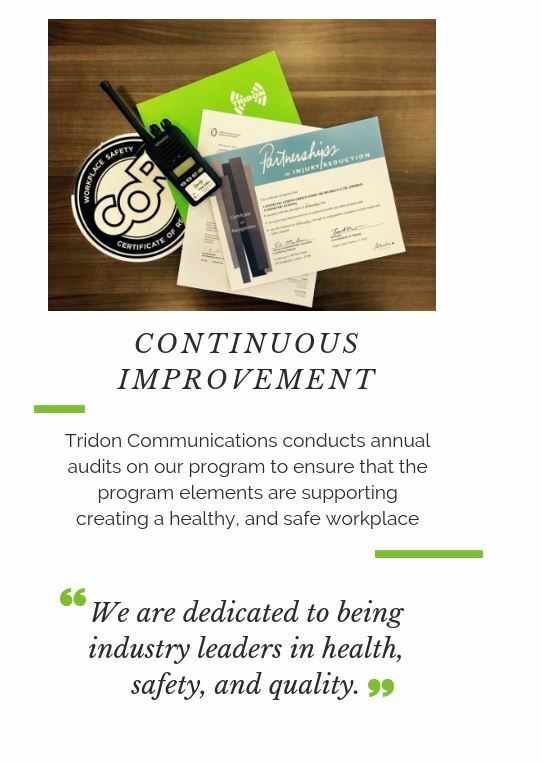 Tridon Communications encourages everyone at our worksites, including subcontractors, clients, suppliers, and the public to be active participants in maintaining health and safety on the worksite. Safety is everyone’s responsibility. That’s why Tridon employees, and those working on our behalf, are responsible for their own safety and well-being, and that of those around them. This responsibility helps create a positive working environment and fosters a collaborative approach to safety amongst our own team and when we work with yours. Tridon’s safety standards meet or exceed Alberta’s industry and legislated standards. This is more than a safeguard of the health and well-being of all personnel and assets; it’s good business practice. It creates a productive environment that minimizes downtime due to injury, equipment damage and follow-up investigations. It creates a workplace where everyone can focus on their assigned tasks because the approach to it has been designed with their safety as the top priority. If you have questions about our Health and Safety Program, contact Tridon and ask for our Health and Safety Manager.